We are a small, family run company that has been cultivating and producing estate grown oil in the hills of northern California since 2002. Deergnaw Olive Oil is a unique blend. We don't think that there is any other oil that has the particular varietals of our oil. From Lombardia in the north of Italy, the Cassaliva; from Liguria, also in the north, Taggiasca; from Puglia in the extreme south-east, Coratina; and from Apulia, also in the south, Nocciara. There is also a smattering of Picholine from France and a touch of Pendolino from Tuscany as the pollinator. 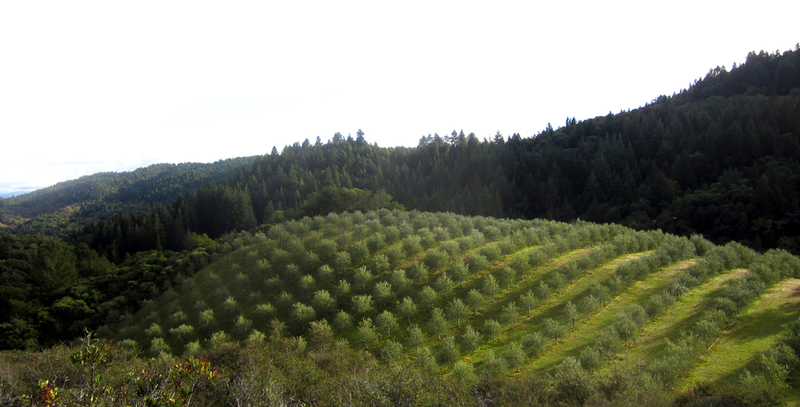 Our Family-run orchard lies in the picturesque hills of northern California's wine country. Approximately 700 trees comprise our three and a half acre orchard. We planted the trees, mostly one gallon size, fifteen years ago and the first fruit appeared three years later. Since then, each year we have had an ever-greater yield. This year the orchard produced 7 tons of olives, which translated into 150 cases of 500 milliliter bottles compared to 69 cases in '07. The beginning of Deergnaw Olive oil was somewhat of an ah-ha moment. One day Russ and his wife, Arlene, decided to take a walk on a property across the road from their home. Besides the beautiful views, every now and then in the midst of robust chemise brush a small olive tree would peek its head above the foliage. Additionally, on the top of the hill there was a five tree cluster of grandfather 100-year old olive trees around a rock outcropping. Russ figured that if these bird-born seeded trees could grow in this inhospitable soil without irrigation or any added nutrients, then it would be an ideal location to put in the olive orchard that he dreamed of. The oil we produce has been awarded multiple gold and silver medals and continues to grow organically alongside our family. Deergnaw, the name we gave our home, our land and our olive oil, sits three miles up Chemise road, a rural dirt road in the hills west of Dry Creek Valley. We are located about seven miles from downtown Healdsburg, a beautiful wine country town filled with fine restaurants, hotels, B&B's, shops, galleries, great bakeries and bookstores. The surrounding valley is filled with picturesque vineyards and world-renowned wineries. Compromising 270 acres, Deergnaw is filled with incredible fruit, vegetable and flower gardens. All envisioned, created, tended and ever-modified by Arlene and maintained and cared for by our long-time caretaker, Augustin. The land around the house and orchard has a variety of eco-systems: redwoods, native oaks, madrone, chemise brush, manzanita and meadows. The one and a half acre pond, long hiking trails, and sweeping views of Dry Creek Valley are just added bonuses to this blessed land. Deergnaw is truly a magical place.